The Right Lizard and Landscape for your Lizard Cages! 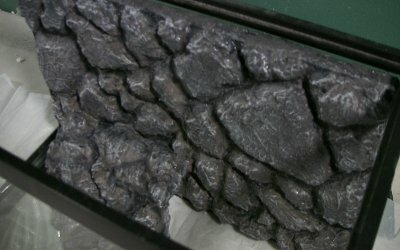 Lizard-Landscapes.com is a helpfull guide about lizards, and the art of creating a fake rock wall landscape. Learn about reptiles such as bearded dragons. Learn how to (with a little bit of effort) construct a natural looking fake rock landscape that will please your pet's eye as well as your own. Also be sure and stop by the Lizard store for fun lizard t shirts! 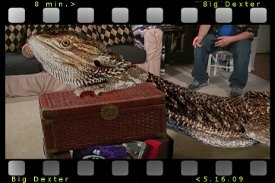 Or check out the short film "Big Dexter" -the story of a 14 foot bearded dragon. So, spruce up your lizard cages with these fun and interesting projects! Check out my YOUTUBE Channel for easy access to all of the landscape videos. There are a lot of reasons why you would want to build a fake rock hide for your pet. The main reason is: you need to provide a sense of security and safety for your pet. A hide or two can enable a pet to take refuge from an assumed threat or danger, and thus make a critter feel less stressed. There are, of course, many other reasons why you would want to build one of these projects. Maybe you're a hobbyist and want to get into building various types of models for your collection -whatever the reason feel free to learn all you want from this website. Check out the above Autumn themed waterfall. This can be made as a tabletop waterfall to enhance your living room or office! It could be a great addition to any relaxation area of your home. The fake rock landscape project pictured above took a very long time to complete. It was quite challenging, but fun at the same time. My goal was to create something that did more than just cover the back wall of a reptile terrarium. I wanted to try and fill the cage with a naturalistic feel. I wanted to provide a slice of the wild-that was as realistic as possible for a pet lizard. If you attempt to build any of the projects (concerning lizard cages or any other use) on this website it is at your own risk, specifically at the risk of your own pet. Lizard-landscapes.com cannot be held responsible for accident or injury pertaining to the use of the techniques described on this website. 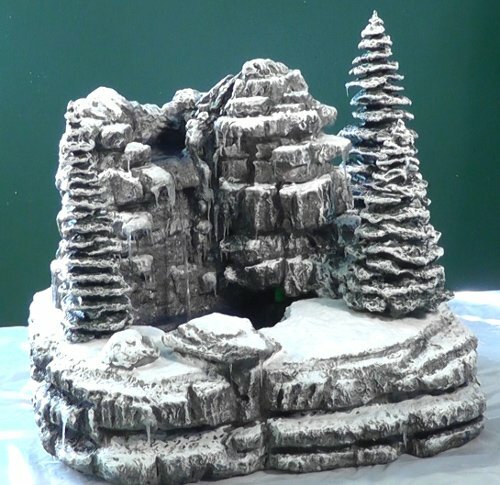 Below is a tabletop waterfall with a winter theme. This one will challenge your scale model building skills, and/or hopefully enhance the decor of your living room. 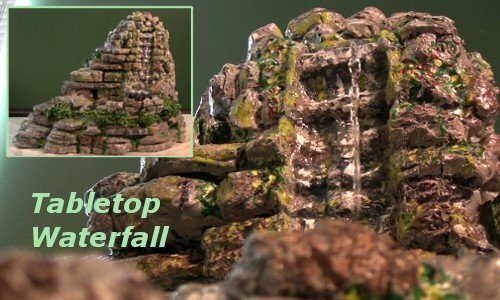 The project below is another tabletop waterfall. This is also more of a decorative piece, meant for indoors -but could also be appropriate for an outdoor garden. The waterfalls below this one are more geared towards frogs and other aquatic animals like a Chinese water dragon. 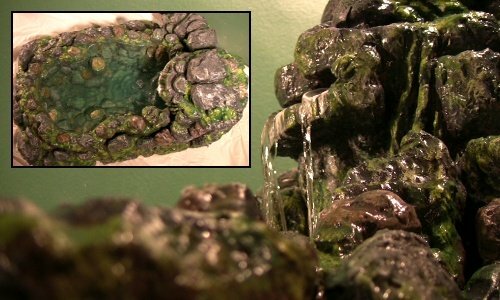 Does your reptile habitat (terrarium) need a waterfall? Check out the image below to watch a three-part series on how to build a waterfall for your terrarium. The techniques provided will hopefully motivate you to enhance your reptile habitat beyond your pet's wildest dreams. It might also improve the look of your living room too! Instead of a canyon waterfall how about a grey rock rainforest waterfall theme? 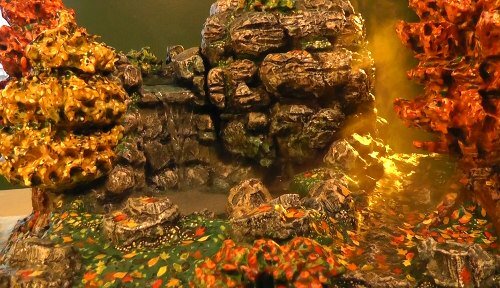 The model waterfall below was constructed with a slightly different process -hopefully providing an easier way to quickly change out the water in your terrarium. Each project has a demonstrational video, showing the steps it took to create it. Check out the project's picture to watch a video detailing the construction. Below is a waterfall for the beginner. This waterfall is based on the Autumn theme waterfall on this site. Start out by watching this, and get some ideas before you move on to one of the other waterfall projects. Here's a rock wall background for a reptile terrarium. 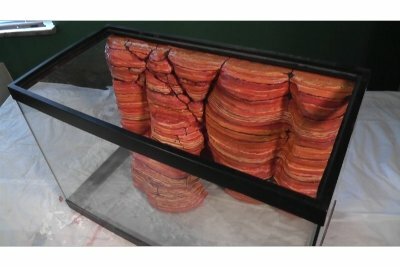 This is probably one of the easiest projects on this website, and it will enhance your lizard's cage and your living room's decor. 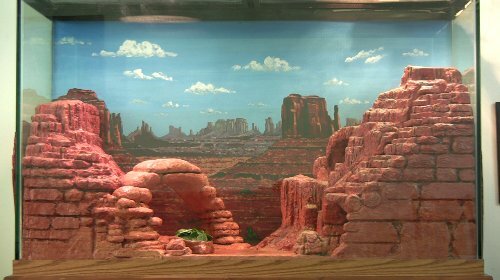 Here's another fake rock wall background for a lizard cage. It's a sandstone theme rock wall that can give you desert landscape ideas for your terrarium. Here's a model of Mt. Everest! Learn how to create this for your pet lizard or contruct this for wargame miniatures. Here's another reptile cage background design. It could also function as a 3d painting for your living room. What about creating something different, like a medieval castle on which your pet gecko can climb? Get creative with what could be considered a lizard-landscape. 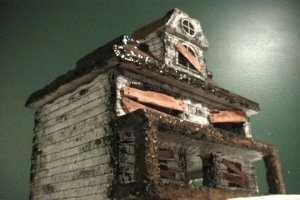 Check out the castle below to watch a two-part video series detailing the construction of this castle project. 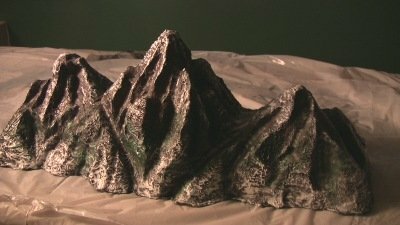 Do you need to build a model volcano for a school project? 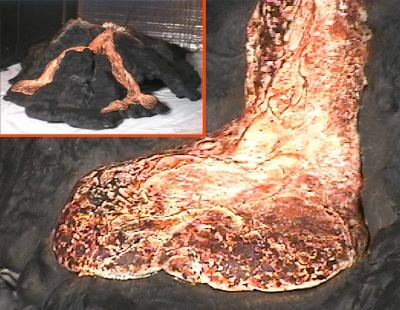 Or possibly provide a volcano for a pet gecko or tarantula to make it's home? 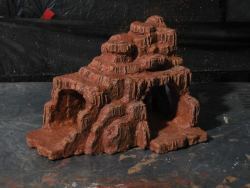 Check out the project below that details how to construct a volcano model. 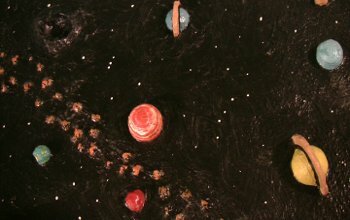 What about a solar system project? This might be quite a stretch to be considered a lizard-landscape but you could always alter it in order for it to fit into your lizard cage. Of course, if you're trying to create a science project this is always a popular option. Be sure to stop by the project below where my bearded dragon becomes the first lizard to walk on the Moon... 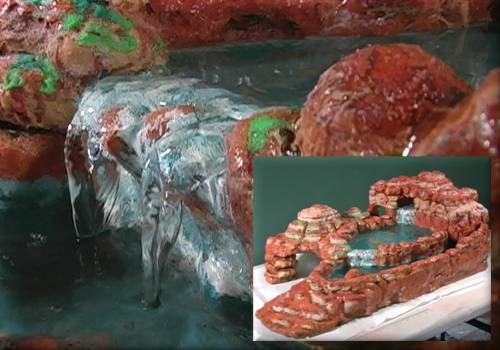 Whether you're trying to create a lunar landscape for a pet lizard or a school project -check out the web page below to learn how to create this Moon landscape. In addition to the lizard cage projects, be sure to check out the new short film "Big Dexter". The story of a 14 foot bearded Dragon! Click on the image below to see the movie. The fake rock landscape projects pictured below are much less time-consuming, but still provide an interesting structure for your pet (what ever you may have) to climb on, hide under or bask upon. 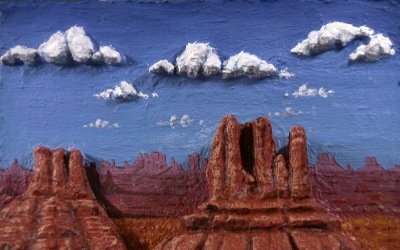 Below, is pictured a beginner level fake rock landscape. 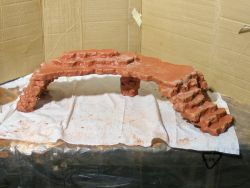 This is where you might want to start, as it's probably not going to get much more basic and easy than this very simple rock bridge. Even though this project is very simple, it still provides a potential basking spot, hiding place and something on which to climb. So, include some interesting lizard decor and your lizard cages will never be the same! When feeding your reptile you might want to feed him in a separate container, having live reptile food climb and hide in and around the fake rock might be tough for your lizard to find. The next project is a nice little corner unit that's more of an intermediate level. Depending on your time and/or skill level, you could spend weeks if not months adding all kinds of detail. Pictured below, is a much more basic Castle project you might want to do just for yourself. 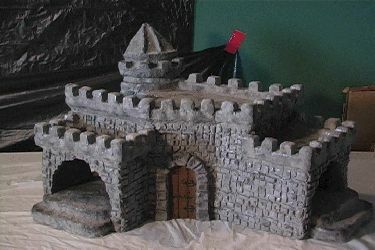 The techniques involved in creating this castle can provide an authentic stone look, giving it a very realistic appearance. Of course it's perfect for lizards such as dragons, but there might be several types of pets that could enjoy this. Or how about a fake tree project? The structure below might suit the terrarium of a tarantula, tree frog, snake, Vietnamese centipede, as well as certain types of lizards. You know you've always wanted a little haunted house. This one's a bit of a stretch to be a lizard landscape, but geckos and especially tarantulas would definitely appreciate the project pictured below. 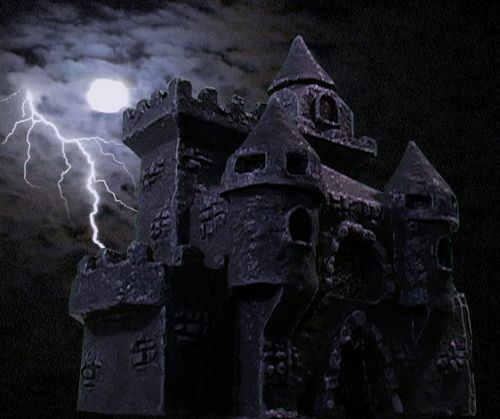 Take your time, and put your own creative angle into Building your haunted house model. 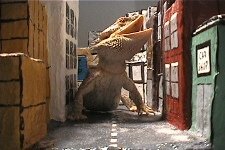 You know you've always wanted to see your pet lizard attacking a city like Godzilla...Click on the image below to see a video on how to create your very own fake rock miniature city.